The 377th Theater Sustainment Command soldiers work on their Structured Self-Development during their annual training at Camp Shelby, Miss., June 1-14. The 377th HHC Commander Capt. Joseph Konyha and 377th HHC 1st Sgt. Daniel Beard have provided their soldiers with a SNAP (SIPR NIPR Access Point) Package that provides internet access and multiple laptops that troops can use to work on SSD in conjunction with their field training exercises. You hate them, and you haven't been shy about saying so. 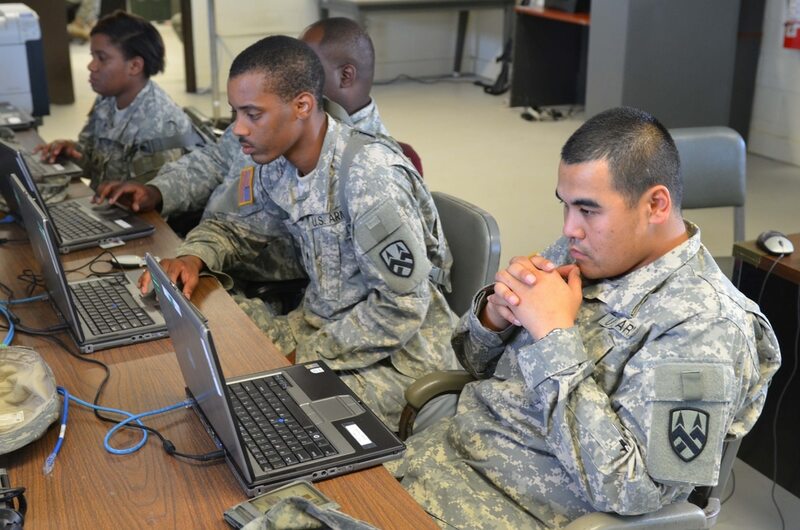 On social media and elsewhere, soldiers have consistently blasted the online Structured Self-Development courses every soldier must complete before attending a resident professional military education course. Well, the senior enlisted soldier at Training and Doctrine Command has heard you. "I hear the force on that," said Command Sgt. Maj. David Davenport. "After the first of the year, we're going to look at SSDs." The much-maligned courses are not going away, however. "We have to have that," Davenport said. "The force sees it as a 'check the block' [requirement], so it's going to be better quality, more challenging." The goal also is to make SSDs more interactive, rigorous and relevant, he said. Structured Self-Development is an important part of a soldier's preparation for the PME course they're about to attend, Davenport said. "You have to think about all three domains of leader development," he said. "There's self-development, institutional development and operational." Davenport recently launched a blog, and he wants to hear from you — about SSDs and any other NCO education issue. "I'm really reaching out to soldiers because I want to hear from them," he said. "I think it's important to communicate to the force. I want to hear actionable comments from the force. As I've said, SSDs are not going away, but how can I improve it? Tell me what the problem is, and I'll get people to look at it." You can find Davenport’s blog here. http://www.tradocnews.org/category/straight-from-the-csm/.